J. P. Gangooly belonged to the extended Tagore family in Calcutta. Like many of his class of affluent gentlemen artists, Gangooly didn’t go to art school but was a product of private art training at home, initiated later into art by Abanindranath Tagore. Gangooly painted at the time of rise of new nationalist and modernist art movements. The skills he commanded in illusionist oil painting, realist portraiture and landscapes were all part of the essential training that marked the formation of the new professional artist in colonial India. Over the first decades of the 20th century, the artist demonstrated his flair in various genres, ranging from portraiture to neo-classical and mythological paintings. However, landscapes and riverscapes became his chosen genre where he developed his special style of densely mist-laden atmospheric effects of sunrise and sunsets on bathing ghats, river banks and mountain ranges. Gangooly especially surpassed himself in the picturesque views of the Himalayas, and in the village and river scenes of Bengal. He painted nearly a hundred oils of the sun setting on the river Padma, which earned him the sobriquet ‘Painter of Padma’. In 1905, he was elected the joint chairperson of the Bangiya Kala Samsad, Calcutta, and founded the Indian Society of Oriental Art, Calcutta, in 1907. 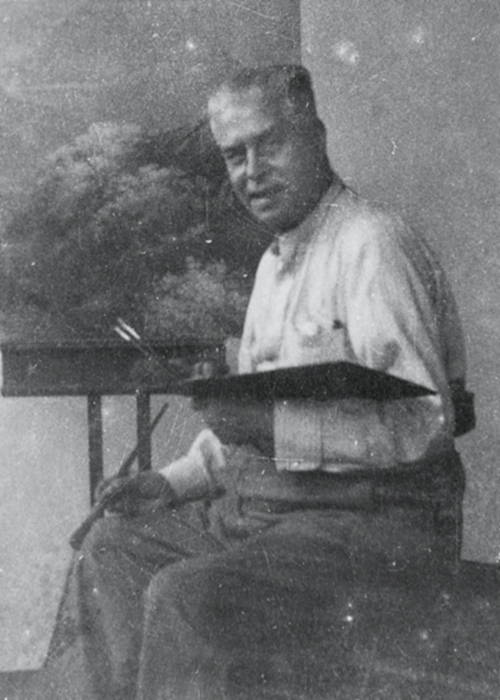 In 1936, he was elected joint director of the Academy of Fine Arts, Calcutta. Gangooly became vice-principal of the Government College of Art & Craft, Calcutta, in 1916, a position he held till his retirement in 1928.